In fact, what they’re doing just shows how serious they are about this new form factor. One of the mistakes OEMs seem to make is that when they come up with a new and unique design they don’t market it very well. For instance, I’m convinced the Motorola Moto Z is better than an iPhone for most people, thanks to the modular accessories. Since it’s a different kind of form factor, it requires a much more aggressive marketing campaign to make people want the difference. But vendors like Motorola just never seem to budget that level of effort…and the result is Moto Z sales lag significantly compared to Samsung, Huawei and Apple, who have more cookie-cutter products. These spots could make a difference, if the campaign is compelling and if it runs long enough. One of the most fascinating things about executive leadership in most technology firms is that they generally don’t get marketing. It doesn’t seem to be taught in engineering schools and even those that get business degrees either opt to not take those classes or didn’t understand what they were taught. The result is that, in general, marketing is underfunded and staffed by people that don’t understand the critical parts of human nature that form the foundation of successful marketing campaigns. But even Tim Cook doesn’t seem to get the importance of demand generation and the result is that Apple now trails both Samsung and Huawei in Smartphone sales and overall sales volume has suffered. People forget that before the iPod selling a music player for more than $200 was virtually impossible and that before the iPhone you pretty much couldn’t give screen phones away. This last was because folks hated screen keyboards, there really wasn’t much you could use the big screens for (since the majority of Smartphones back then had keyboards and smaller screens). In addition, there was an industry belief that Smartphones were just for business which resulted in the death of what could have been the Palm iPhone killer before it ever launched. To get people to even consider buying something that is very different than the norm you must go out and aggressively build advocacy. This means running lots of ads with people using the product, product placement in TV shows and movies (when possible) and building up advocacy with influencers (often celebrities). This last is what Apple did particularly well as almost every news anchor got a free iPhone and regularly showed the thing off. Microsoft has been surprisingly aggressive with the TV ads. Historically the company has been very aggressive with product placement in TV shows, but I have yet to see a Surface Go in one. This may be because those shows are still taping and won’t launch for a few weeks yet. This is also an initial effort focused on back to school and small business where this product should do best. I’m expecting a future version supporting their Connected PC initiative which should allow the product, assuming it is successful, to branch out into other segments and force an adjustment in the type of ad shown. But this level of support suggests Microsoft is very serious about Surface Go as a breakout product and they’ve executed what appears to be a well-funded demand generation campaign around it. Sometimes it is hard to tell whether a company is serious about a very different offering like the Surface Go or not. One way to tell is how well they fund demand generation marketing around the offering and, in this case, the level of funding seems to suggest Microsoft is very serious about this small form factor. 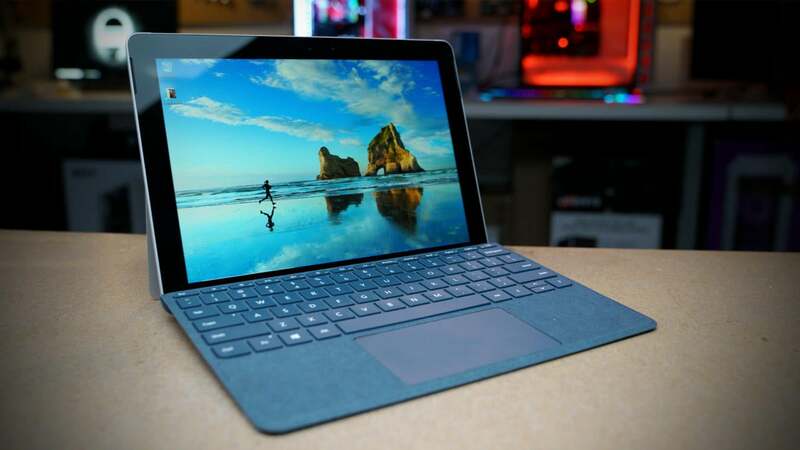 Given I think their end game is to create an Azure centric computing future with more of a thin client vibe, the Surface Go may be a stalking horse eventually focused on that opportunity. Though, in that case, it will likely be in its future Always Connected form. We’ll see, but there is a good chance there will be a Surface Go like product in most of our futures, how long it takes to get there will depend on Microsoft’s attention span, marketing execution, and related budget. Right now, that all looks pretty good. Rob Enderle is president and principal analyst of the Enderle Group. Previously, he was the Senior Research Fellow for Forrester Research and the Giga Information Group. Prior to that he worked for IBM and held positions in Internal Audit, Competitive Analysis, Marketing, Finance and Security. Currently, Enderle writes on emerging technology, security and Linux for a variety of publications and appears on national news TV shows that include CNBC, FOX, Bloomberg and NPR.